Learn to make your own skateboard or longboard in this class. You will learn to laminate maple veneers and use vacuum molding to custom shape your board, plus learn all about finishing and the hardware involved. Instructors will demonstrate why Hard Maple is the wood of choice for most skateboards. You will learn how to glue and press the Maple veneer in a vacuum bag or hydraulic press to make your own board. Select from a variety of Molds to make your own custom deck. Sanding, sawing, and Wheelbase drilling will also be demonstrated. The Technology Association of Louisville, Kentucky (TALK) and Marwood are pleased to partner in offering you this unique learning experience. Skateboard Deck building can be used as a focus to include a wide range of subjects in your STEAM (Science, Technology, Engineering, Art, and Math) curriculum. A third day of Board decoration is available on June 15 at an additional cost of $30 per student. You will learn how to apply a custom paint job and clear coat for your ultimate, personalized board. You are paying for the learning experience as well as the board. Participants will learn about the camber, concave, and kick tail designs, as well as vacuum pressure and other topics. 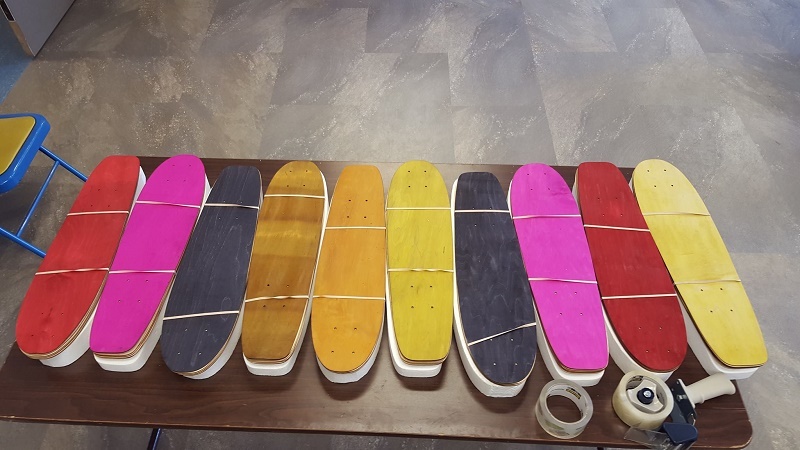 Each person will glue, laminate and finish their own Maple Street Deck skateboard. Fee for 2 Day Session: $115 for a mini-cruiser, $135 for a street deck, and $155 for a longboard. Trucks and wheels not included, but will be available for purchase.